The ethical, spiritual, recreation, and educational values of such an area are those one cannot put a price tag on any more than one can on a sunset, a piece of poetry, a symphony, or a friendship. On December 20, the Bureau of Land Management announced the release of the Draft Environmental Impact Statement (DEIS) for oil and gas leasing in the Arctic Refuge, which was officially published in the federal register on December 28, marking the beginning of a comment period that ended March 13, 2019 (extended following the government shutdown). December 22, 2017 marked the one year anniversary of the Tax Cuts and Jobs Act (Public Law 115-97). Sen. Lisa Murkowski snuck a rider into this GOP tax bill to open the coastal plain to oil and gas leasing, and changed the purpose of the refuge to also “provide for an oil and gas program on the Coastal Plain.” Included are requirements to hold no fewer than 2 lease sales area-wide within 10 years, with the first within 4 years and the second within 7 years, and no less than 400,000 acres will be offered in each sale. During the comment period, Alaskans from all walks of life stood up and spoken out during the comment period on the BLM’s Draft Environmental Impact Statement on Coastal Plain leasing. We at the Northern Center are deeply grateful for all the efforts that you all have made in the fight for protections that the Arctic Refuge deserves and that a broad coalition has been fighting for for decades. In addition to writing substantive comments pointing out the multitude of inadequacies in the document, also outlined in leaked memos which Public Employees for Environmental Responsibility made public on March 12, Arctic Refuge defenders, here in Fairbanks and across the country, wrote community perspectives and letters to the editor, showed up to rallies and meetings, shared their knowledge about the Arctic Refuge, and talked to our communities about the importance of continuing to defend this place. We are humbled and strengthened by the commitment of Gwich’in and Iñupiaq leaders, scientists, business owners, outdoor enthusiasts, and so many others, and know that, even though our elected officials speak as if exploitation of the Coastal Plain is a done deal, there is an unfaltering community committed to its defense. In addition to our own substantive comments, we submitted this open letter from 71 business owners to Department of Interior Secretary Bernhardt and Assistant Secretary Balash, stating that “As business owners, we represent a wide range of backgrounds and priorities. But we all oppose the current effort to open the Coastal Plain to seismic testing and oil and gas exploration and drilling. 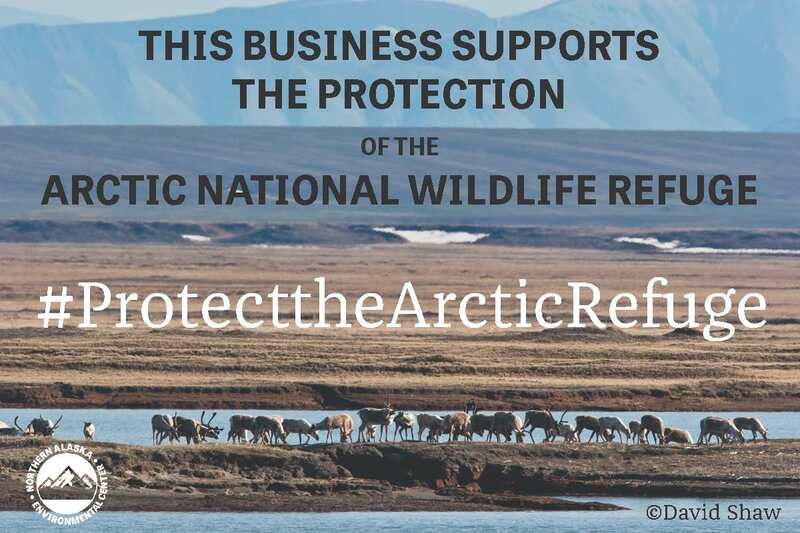 We believe permanent protection of the entire Refuge is in the best interest of Alaska and the nation.” The businesses ask their clients and customers to join in commitment to defending the Arctic Refuge. While BLM assesses the comments submitted on the Draft EIS, which we believe was insufficient to uphold NEPA process requirements (16 State Attorneys General submitted a letter that argues this point as well), we will remain vigilant, and will continue to engage at every stage of this process. Though we have successfully stalled seismic testing for this winter, the assessment and permitting process still moves forward. And it remains as important as ever to keep the Arctic Refuge in the minds, hearts, prayers, and meditations of our communities; keep up the letters, calls to legislators, and conversations. We’re just getting started. The BLM is undertaking a Coastal Plain Oil and Gas Leasing EIS to implement the leasing program pursuant to the Tax Act. Scoping for the environmental impact statement ended in June with over 680,000 people speaking up to voice their concerns over drilling in the Refuge (For detailed background on the scoping process, click here. For information on talking points and considerations, click here.). The draft EIS should have reflected the concerns brought up during scoping. Public meetings were held in Anchorage, Arctic Village, Fairbanks, Kaktovik, Fort Yukon, Venetie, Utqiaġvik and Washington, D.C. Protectors and advocates of the Arctic Refuge delivered a clear message at the meetings, and in later media coverage: drilling does not belong in the Coastal Plain. The release of the Final Environmental Impact Statement, expected this fall, does not require a public comment period. A separate and less rigorous process to review a proposal to explore for oil and gas in the coastal plain has yet to be completed. SAExploration has submitted a permitting application to begin 3D seismic exploration for oil reserves on the coastal plain of the Arctic National Wildlife Refuge during the winter of 2018-2019. Their plan is to have convoys of 30-ton thumper trucks and mobile 150 person camps moving across the entirety of the coastal plain in 650 ft intervals. The potential cultural and ecological impacts are significant, and following the government shutdown and public demands for a rigorous examination of these impacts, the process has been delayed and seismic testing is unlikely this winter. Still, BLM intends to move forward with this process, and your voice is needed to keep up the pressure. Polar bears have already been flagged as being potentially impacted by this work and the US Fish and Wildlife Service is consulting with BLM to write an Incidental Take Regulation. This process also warrants public comment. The Gwich’in people, who have depended on the resources of the Arctic Refuge since time immemorial, are united in their opposition to oil and gas development in the coastal plain. Their way of life is inextricably tied to the caribou of the Arctic National Wildlife Refuge and its coastal plain, a sacred area they call “Iizhik Gwats’an Gwandaii Goodlit” or “the sacred place where life begins”. Protecting the Porcupine caribou herd is a matter of human rights and food security. Many beings’ ways of life are at stake here. Since it was first federally protected by President Eisenhower in 1960, the Arctic Refuge has been one of our nation’s most iconic public lands. It is home to the over 200,000 animal Porcupine caribou herd; to musk oxen, wolves, polar bears, and nearly 200 species of migratory birds that stop in the Refuge to eat, molt, and nest en route to and from six continents and all 50 states. Its biological heart, the coastal plain, is no place for oil and gas. For almost 60 years, the American people and Congress have continually reinforced the fact that the Arctic Refuge is worthy of protection and is no place for drilling, as industry and the Alaska delegation have repeatedly attempted to open a pipeline into the region. It is our moral obligation to protect this landscape for future generations to experience, enjoy, and rely upon. The impacts of drilling in the coastal plain would be irreversible; this untrammeled landscape containing intact ecosystems, millennia of human tradition, and a legacy of international and inter-cultural support for continued protection will be irrevocably transformed in ways we cannot predict. The two volume Draft EIS consists of over 750 pages. See this link for detailed talking points to include in your comments. Feel free to contact Ryan Marsh, our Arctic program coordinator at ryan@northern.org with any questions or concerns, and as always, thank you for all you do on behalf of Northern Alaska’s lands, waters, and communities. Write a letter to the editor of your local paper. Share your reasons for supporting continued protection of the Arctic Refuge. For a couple examples, see these two recent letters by Stephen Harvey and Sarah Furman. For more pointers on writing an op-ed or LTE, see this recording of organizer Alyssa Quintyne’s recent presentation; she covers writing an LTE around minute 23:00. Attend a rally or educational event and learn more about the importance of the Arctic Refuge. Join our email list to keep up to date on Fairbanks events. Are you an Alaska business owner? Then download and print the image below to display in your business!